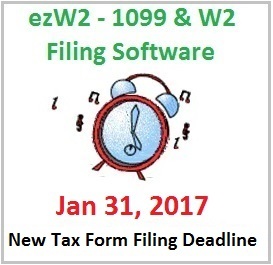 The 2016 version of ezW2 tax preparation software has been released with the capability to print 1099 MISC forms in batch quantities. Test drive with no cost or obligation at www.halfpricesoft.com. Miami, FL, January 26, 2017 --(PR.com)-- The Jan. 31 W2 1099 tax form deadline is fast approaching. Printing 1099 MISC forms for contractors should not be headache for employers this 2017 tax season. ezW2 software from halfpricesoft.com makes it easy to paper print, pdf print and efile 1099-MISC and 1096 tax forms. The new 2016 edition also includes batch print feature for 1099 forms. With this option, businesses and tax professionals can work smarter, not harder by printing with just one click. 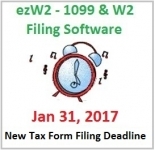 “ezW2 tax software will save time for business owners by printing 1099 MISC forms in batch form this 2016 tax season,” said Halfpricesoft.com Founder, Dr. Ge. Prices start at only $39 for the single user small business version ($79 for the new Enterprise version) EzW2 2016 software automates the process of completing, printing and filing all the W2, W3, 1099-misc and 1096 forms. - ezW2 can print all W-2 and W-3 forms on white paper to cut cost on pre-printed forms. And the black and white substitute forms of W-2 Copy A and W-3 are SSA-approved. - ezW2 supports the optional PDF and E-File. For users who want to go green with the paper saving Efile feature, no pre-printed forms is needed to file W2 and 1099. - EzW2 can import recipient W2 and 1099 data from the external file to saving typing time. ezW2 2016 can be downloaded at no cost or obligation for compatibility for up to 30 days at http://halfpricesoft.com/w2-software-free-download.asp. The trial version will print forms with TRIAL watermark and limit e-filing. Once customers register their downloaded software and enter a purchased license key the software unlocks for unlimited use. ezW2 is compatible with Windows 10 systems. It can also run on Windows XP, Me, 2003, Vista, 7, 8 and 8.1 systems. Designed with simplicity in mind, ezW2 2016 is easy, flexible, inexpensive and reliable. The Halfpricesoft.com developing team is confident that this tax software is easy enough for new users who have only basic computer skills and little accounting know-how.